Review: I was recently given the opportunity to check out another box from Book Roo, a book subscription company specifically for kids. You can either choose the board books (you’ll get 3) or the picture books (you’ll get 2). I went with the picture books because I knew I’d eventually be able to share these with my eldest niece and nephew, who are six and five. The boxes are $22.99 per month, but the price goes down if you sign up for a recurring subscription (3, 6, and 12 month options). One of the things that I absolutely love about Book Roo is that the books come wrapped! Isn’t that such a fun way to get books in the mail? I know my niece and nephew would love having something to unwrap every month. Along with the wrapped books you get a brochure that shares a little information about each book, giving you a taste of what to expect before diving in! Book Roo is a great company that really wants to make sure families are happy with what they are getting. If you happen to get a book that you already own, take a picture of you giving the book to someone else and you’ll get $5 off your next subscription. 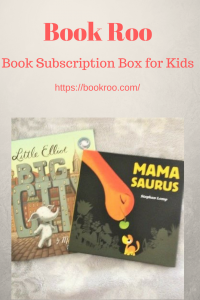 You can also contact Book Roo if you have kids in differing age groups and they will happily alternate which box you get every month (back and forth between the board books and the picture books). I hadn’t heard of either picture book I received in the box, which was exciting! I love discovering new books. 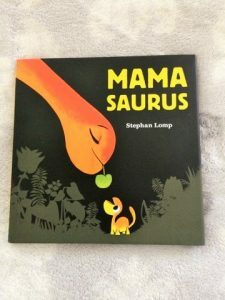 The first was Mamasaurus by Stephan Lomp (Goodreads link). This is such a sweet book about a baby dinosaur who is asking various dinosaurs if they have seen his mama. Of course, his mama is right there looking for him in the end! The illustrations are simple, but bright. Definitely a cute read! 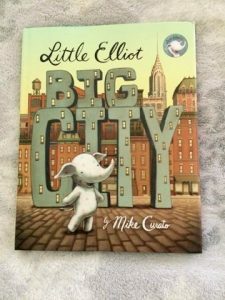 While I liked both books, Little Elliot, Big City by Mike Curato is probably my favorite of the two (Goodreads link). This is such a cute book about not fitting in, and then finding someone just perfect for you. Elliot is a little elephant who loves the big city but he often feels like he’s not being noticed…until he meets someone even smaller than him, and they learn they can help each other. There were such cute, whimsical illustrations, and it’s a book that should definitely be added to a kid’s bookshelf. I definitely cannot complain about either of these books, and Book Roo as a whole. It’s a really fun subscription service that provides an exciting way to get kids into reading! I don’t know where you find all of these goodies, but please keep them coming. I cannot wait for my Squeak to be a little bit older so we can get in on this fun! Kids will love getting new books in the mail every month! This would be an awesome Christmas gift for someone, the subscription! What a great idea in time for the holidays. Thanks for the heads up! How cool! I think my babies would love this! I LOVE the idea of gifting books for children, and a subscription will be so fun! Thanks for the amazing idea! What a great idea! I love this subscription box! This is a fabulous idea! I need an adult version because I also have trouble finding books I want to read. I love the idea that if you have the book you can give it to someone else and get $5 off. What a great incentive for paying it forward and sharing the love of reading. These books look adorable! I love Mike Curato’a the Little Elliot, Big City. The illustrations are simply magical! I’m still considering this for my little guy, such a fun way to read some new books and you are right, what kid doesn’t like getting fun mail like that? Such a cute idea! Love gifting books instead of toys. This would be such a great gift! I love that there’s a subscription service like this for kids. How cool! And they wrap the books? That’s fun! Perfect for readers and maybe even for some who might not be readers yet. Love the look of Mamasuarus, BTW. So cute. This sounds like a great gift. I have three daughters, they all love books and love to read. 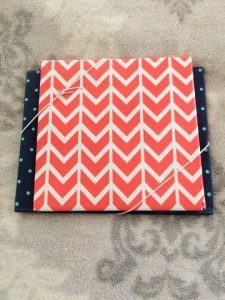 Oh wrapping the books is a clever idea! I’ll have to suggest this one to a couple of cousins with littles. My mom ordered books for me every month when I was a little girl. I couldn’t wait for the next box to arrive! Such a cute idea! And a good way to motivate your kids to keep reading. The price is definitely not bad either, for three books! If I ever have kids, I will definitely do something like this for them. I’ve heard such good things about BookRoo, I think it’s a great idea! And those books look so cute too 🙂 I’m a loyal library user and don’t buy a ton of books, but I know my son Jona would love this! Okay, this is definitely a subscription I can stand behind. Love that you actually get a choice to have picture books. My kids would love this – it’s like a surprise once a month! Will have to check it out – thanks so much for sharing! You’re so welcome, Savannah! I hope you like it if you do subscribe! I just love how many subscription boxes there are available these days! My kids would love something like this! They’ve added a junior box too, Carrie, that might fit your kid’s ages better! What a great idea for a holiday gift! Those 2 books looks adorable 🙂 Thanks for sharing this with us! This is so cool and such a great way to make kids look forward to reading. I never even thought about how good a subscription box for children’s books would be! It’d be an awesome way to introduce kids to reading, and give them the excitement of opening a present all the time. Especially if you could select age groups/ reading levels and help them grow their reading by challenging them with each instalment. Books are always good 🙂 Those look cute!